Britain’s ferry industry continued its revival in 2014 on over 75 routes, posting increases across the board for passengers, cars and coaches carried during last year. Whilst the ships are affected by the weather from time to time troubles with Eurostar has meant a return to crossing the Channel by the short sea route for some. According to 2014 “Ferrystat” figures, released by industry body Discover Ferries, passenger numbers were up 2.6% or a full million in 2014, to 39.01m (compared with 38.01m in 2013). Passenger cars carried by ferry increased by 1.6% at 8.5m, and over 163,300 coaches were carried by ferry in 2014, a rise of 3.1%. Overall, Continental ferry routes were the strongest passenger growth sector in 2014, up 3.7% to 18.32m with the key Dover – Calais/Dunkirk Channel routes operated by DFDS, P&O Ferries and MyFerryLink up 4.4% to 13.29m. North Sea routes to Holland by DFDS, P&O Ferries and Stena Line were up 2.9% to 1.75m passengers, with the western Channel sector, operated by Brittany Ferries and DFDS, up 1.5% to 2.85m. Ferry passengers travelling to Ireland by operators including Irish Ferries, P&O Ferries and Stena Line, were up 1.4% overall in 2014 to 4.87m, with the “central corridor” Holyhead and Liverpool routes to Dublin the best-performing sub-sector, showing 2.9% growth to 2.13m passengers. The headline has to be as noted ‘Carnival Returns to Europe’ but in truth for 2016 a better heading might have been ‘Carnival births in Europe’ the use of the English language perhaps not appreciated by the Miami moguls. In any event the world’s largest cruise line is not operating this side of the Atlantic in 2015. Next year, with its latest ship, Carnival Vista 3,954 passengers and 136,000 tons, and built in Italy (born in Italy), it will offer a season in the Med. When this latest “Fun Ship”, the Carnival Vista, is introduced 1 May 2016 on it will feature a bevy of new spaces that take on-board entertainment to a new level. An IMAX cinema, 450-foot-plus-long water tube slide and the suspended open-air SkyRide are just some of the fun additions the ship will boast. Other new concepts will include an on-board brewery, Sportsquare, the New England-inspired Seafood Shack and a dedicated families-only zone with lounge and cabins. Carnival Vista sets sail with a 13-night inaugural sailing departing Trieste (Italy). It will be the first Carnival ship to sail in Europe in three years. "Our goal was to make this our most innovative ship to date," Mark Tamis, Senior Vice President of Guest Operations, told assembled guests at a launch announcement in Lincoln Center's JAZZ performance space in New York City. Carnival transformed the venue into several Carnival Vista restaurants and bars including Havana Bar, Seafood Shack, RedFrog Pub, Cherry on Top and Bonsai Sushi. "Carnival Vista is so high energy, so much fun; the most amazing stage for our members to bring to life that fun vacation Carnival is famous for," Tamis said. Tamis also emphasized the ship's connection to the ocean, apparent in its many indoor/outdoor spaces. All restaurants, with the exception of the two main dining rooms, offer outdoor seating. SkyRide is outdoor fun. You don't have to be a cyclist to enjoy the industry's first pedal-powered, open-air aerial ride, though you best not be afraid of heights. With SkyRide, participants climb on-board hanging recumbent bikes to "cycle" their way around the 800ft suspended track, measuring in at up to 150ft above the sea. If the SkyRide doesn't provide enough adrenaline-pumping action, the suspended SkyCourse ropes circuit should do the trick. Both SkyRide and SkyCourse are part of SportSquare, which also offers an indoor hangout, The Clubhouse at SportSquare, featuring mini-bowling, Ping-Pong, arcade basketball, sports video gaming and more. More outdoor fun can be found at the line's largest WaterWorks water park, including the enclosed water tube Kaleid-O-Slide, on which riders make their way around 455ft of twists and turns on one- or two-person rafts..
Carnival Vista will have two main dining rooms, Reflections and Horizons, the latter hosting a small bar in the middle perfectly situated as a meeting spot for pre-dinner drinks. The ship will also feature the line's first dedicated space for Chef's Table. 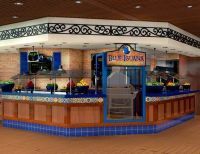 Located inside the main kitchen, the space is separate from all the action by glass walls so diners can watch as food is prepared for the entire ship. Carnival will debut two new cabin classes on-board Carnival Vista. The Havana Cabanas, on Deck 5, come with private outdoor patios that face the Lanai promenade for easy access to the Havana Bar and Pool. A hammock for snoozing the afternoon away gives the patios just the right dash of tropical languor. Kids under 12 looking to get away from their parents can join Camp Ocean, which provides an undersea-themed play area with more than 200 fun and educational ocean-inspired activities. Carnival Vista will sail a variety of Mediterranean itineraries in its first season, calling on ports throughout Italy, France, Spain, Croatia and Turkey. THE 7th ANNUAL LONDON CRUISE SHOW takes place at Olympia on 14-15 February 2015. Business Travel News has negotiated a price of just £2 per ticket against the £10 if you turn up and go to the box office. Easily the largest exhibition of its kind in Europe, most of the major cruise operators will be showing, plus a collection of lesser known companies offering specialist trips, typically the Gallipolis and at the other extreme, the Scottish Islands. Both deep sea and river cruising are being promoted, entirely different products. The free talk programme is always interesting and is an ideal way of learning about cruising if you have never been before. Best of all are the show bargains which are usually dramatic. You can get expert advice and actually book your cabin. For tickets Quote E1 on 0871 620 4024 or visit http://cruiseshowlondon.seetickets.com The offer closes Friday 13 February at 13:00.